I have been thinking about Barcelona recently. It’s such a beautiful city and everywhere you turn it seems there is an explosion of art. Random acts of beauty, more-so then you get with most European cities (which is generally quite a bit). Barcelona even takes the time to make it’s subway stations amazing. Obvious placement not withstanding, I often find the little thing the most delightful and it was very much so the case on the roof of Casa Milà, one of the many Antoni Gaudi masterpieces of architecture. 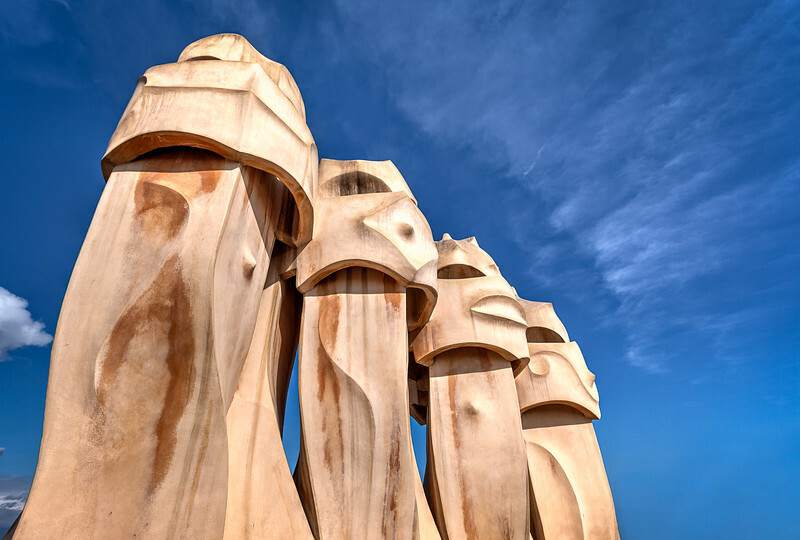 These are some of his terracotta chimney designs, something that most designers would overlook, take on a life of their own against the blue Barcelona sky. To me, Barcelona is Gaudi. It’s an unfair characterization, but when you have a true artist in your city’s history, one so gifted at seeing what others miss, it’s impossible for me not to find comfort. 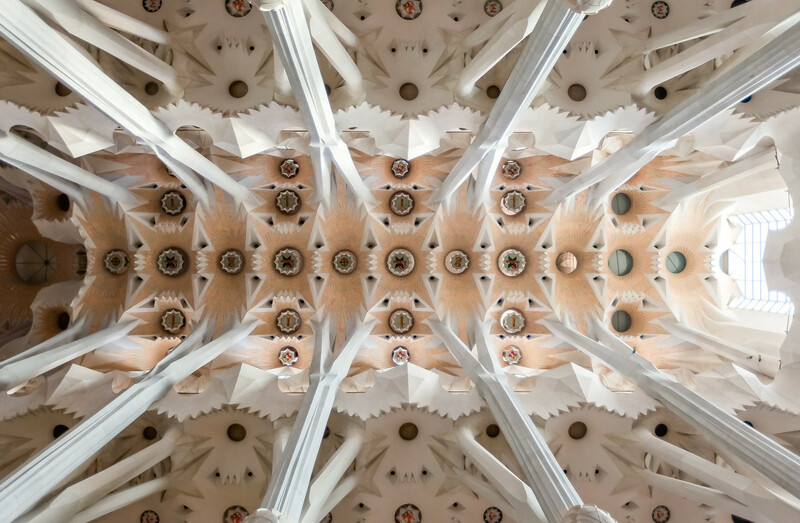 Gaudi is everywhere, or rather it is perhaps that his style is so impactful, one viewing of a masterpiece and it seems all you have seen. Today’s photo was one of his great failures. That too is unfair. 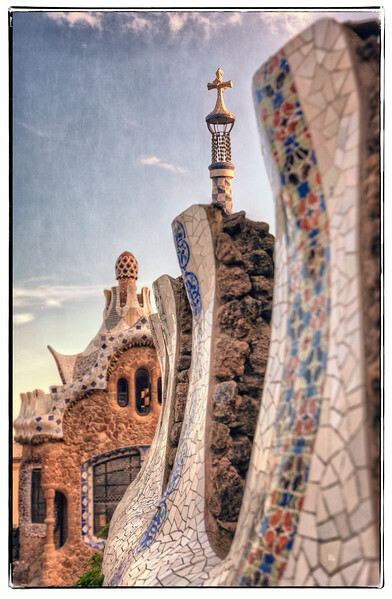 It failed during Gaudi’s time, when I visited it was one of the more popular places in Barcelona. Perhaps this is one of the great lessons for people working or even dabbling in the arts. Even the masters have their critics as it seems in Gaudi’s time no one wanted to live in the Mansions in Parc Güell. I can’t imagine, unless at the time the Park was so far from the city proper, but even then, what views! 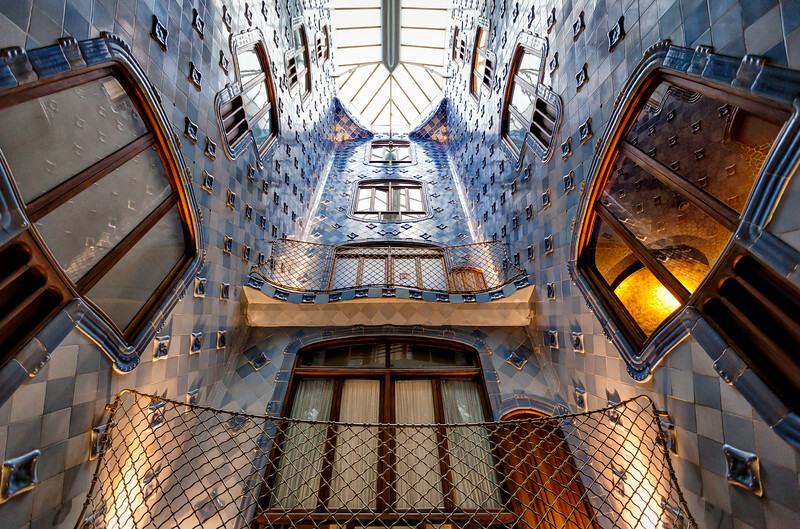 I cant get over the many ingenious design elements of Antoni Gaudi’s homes. 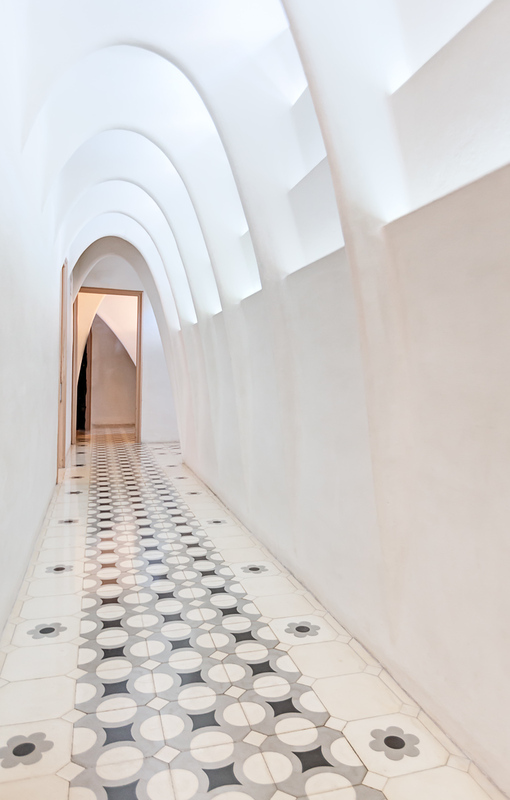 This skylight running through the center of Casa Batllo is a perfect example. The further light has to travel, the weaker it seems. This is something I deal with in photography all the time, but in a multistory home like this it would mean the lower floors would have weak light, while the top floor would be flooded. Gaudi brilliantly used multicolored tiles to counteract this effect. Towards the top the tiles are dark blue. As you get further away from the source of light, the lighter the tiles become. The dark colors absorb more light, the light colored tiles reflect more helping to balance the light to all floors. This area of Casa Batllo is the laundry and servants work area of the home. What’s interesting to me is even in this utilitarian area of the mansion, Antoni Gaudi didn’t stop designing, he didn’t stop the theme. It made me think of a belly of a whale which fits perfectly with the home. 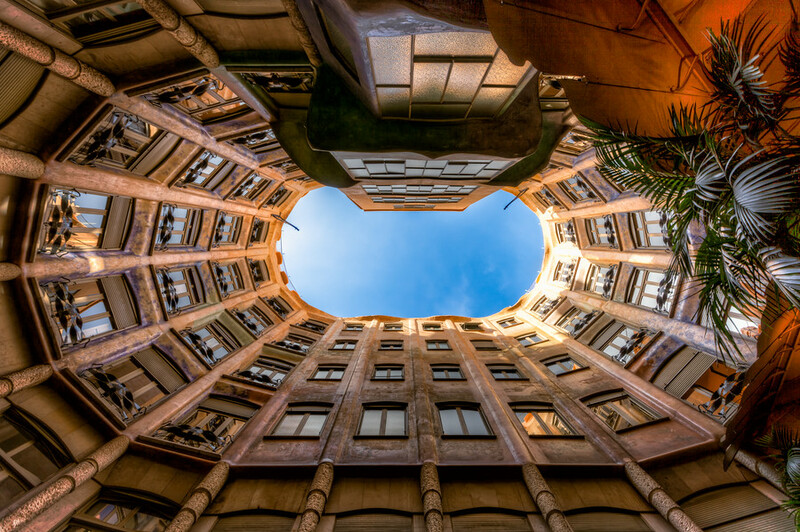 I just loved the way the architect Antoni Gaudi used shafts of open space in the interior of his buildings to get more outside light into what would otherwise be dark rooms. This interior also serves an a common area for guests and residents at the apartment complex called La Pedera, located in Barcelona Spain. This particular shaft of open space is obviously very big, but quite ingenious. I also enjoy how light such an important an element in the design over maximizing usable floor space. It’s not something you see much these days. I kept thinking to myself…this isn’t bad place to live if you could stand the tourists. 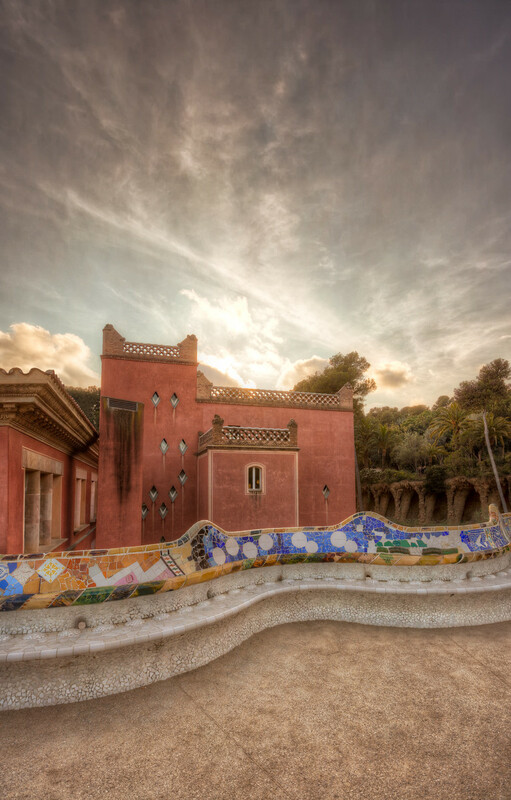 Park Güell in Barcelona is one of those amazing places that had a bad time getting its start. Built by master architect Antoni Gaudi (he fast became one of my favorite historical architects) … it was a flop. No one wanted to live there it seems. I don’t understand why really as the views are spectacular. 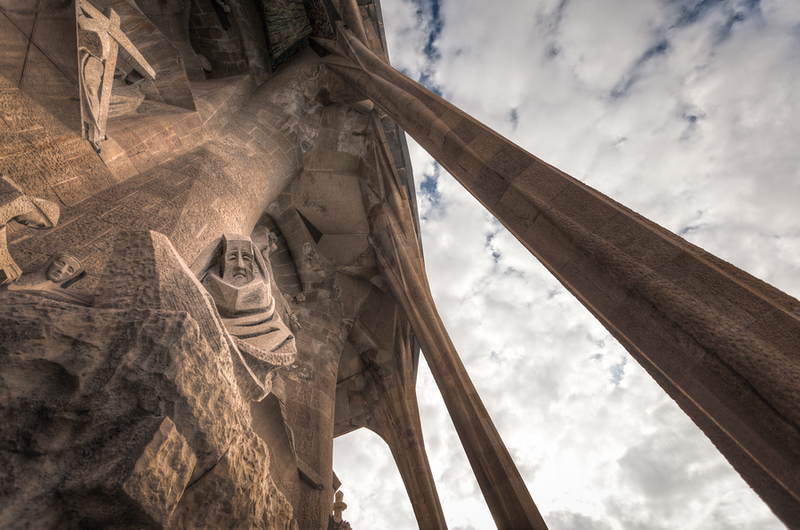 Gaudi purchased the site and lived there from 1906 to 1926. A number of homes have been built on the site since its founding (today’s photo being one), but the Park was converted into a municipal garden, leaving an odd mix of fabulous mansions surrounded by the best views in Barcelona, wholly occupied by throngs of sunbathers and tourists. The facades of La Sagrada Familia in Barcelona Spain are, much like the entire structure, difficult to conceptualize for people who have not seen the site in person. Honestly I am not sure I fully understand. Sure it’s a depiction of the life and times of Jesus, but aside from that, there are things going on in this cathedral that are mind blowing. The Passion Facade was stark and cold, understandable so…the figures were human, but distorted with grief. Here are but a few tortured souls. I love a spiral. Throughout history humans have been enthralled with the golden ratio and to me this particular expression is one of the best. This particular spiral staircase is one of the ultra narrow towers of La Sagrada Familia in Barcelona Spain. 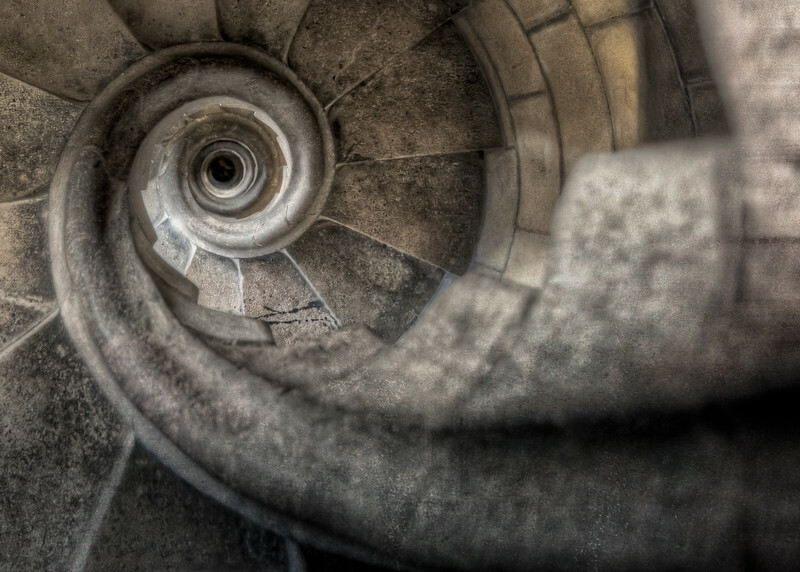 The last spiral staircase I shot was in Paris and people seem to love the Arc de Tripmphe staircase photo. Personally I think I hit the expression of the golden ratio more dead on with this photo and I particularly like the texture. Which do you like best? I have said it here before, but I have the hardest time shooting details. On my more recent trips around the globe, I have really been working to remember this small, but significant mindset. Details make for some stunning photos, as evidenced by this detail. 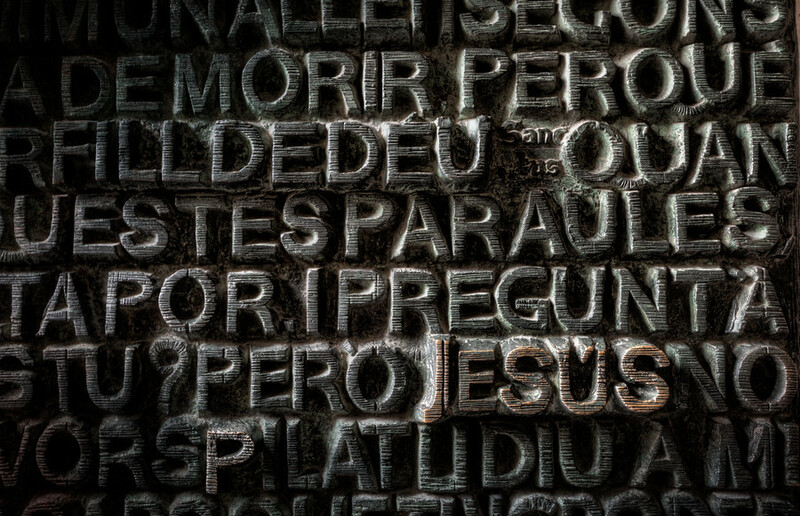 I was struck upon entering the door of La Sagrada Familia in Barcelona, Spain (as I am sure many are) by the door. The entire minor basilica is a bit of a surreal explosion…too much is happening all over. The main door I entered was no different in its busy-ness, but there is a obvious focal point in the mass of words. Maybe it doesn’t work the same for tall people, but for someone my height, there was no doubting the purpose.